Do Strawberry Plants Need Acidic Soil? Q: Do Strawberry Plants Need Acidic Soil? I read somewhere that strawberries have to have acidic soil. i’m planning on putting some in the garden this year but don’t have any experience with growing them. do strawberry plants need acidic soil? If so what do i need to do in order to help me grow a bunch of strawberries this year? Answer to: Do Strawberry Plants Need Acidic Soil? I’m glad you decided to take the plunge and plant some strawberry plants this year! Most strawberry varieties do need slightly acidic soil in order to produce optimally. If you don’t know the pH of your soil, there are a lot of fairly inexpensive testing devices or kits available out there. You can either get one or call your local Extension agency to send and agent out to test it for you. After you’ve tested it (or had it tested), if the pH reading is near 7 (or higher), you would do well to amend the soil to lower the pH and, thus, increase the acidity. There are several things you can do to increase the acidity of your soil. You can add coffee grounds to the soil. This can help slightly lower the pH. Also, in the “all-natural” realm, you can add citrus wastes like leftover orange juice or chopped up peels from lemons, limes, grapefruits, etc. Another easy and natural way to lower the pH is to mulch with pine needles. The needles will decompose and lower the pH as they do. This not only helps the plants, but it keeps the strawberries clean and decreases the likelihood of fungal/pathogen infection. Sphagnum peat will also add acidity as it breaks down, but the process is a slow one. Finally, another simple organic way to raise the soil acidity is to use diluted vinegar. Add some the next time you water, and the soil will usually show a pH drop when you next test it. Be careful to not do too much to lower the pH, though. You can make the soil inhospitable if the pH goes too low. Other solutions can be utilized to acquire reduced alkalinity levels as well. Amending with ammonium sulfate will drop pH right away and increase the nitrogen levels. Granulated sulfur is also a suitable addition for increasing acidity, but it is also slower due to the fact that it has to be broken down by bacteria in the soil in order to lower pH. As with the more natural means mentioned above, it is important to carefully monitor the pH with the addition of these agents as well. On an note different from increasing soil acidity, you may want to reconsider pushing your plants to grow a big harvest this year, if you plant in the spring. 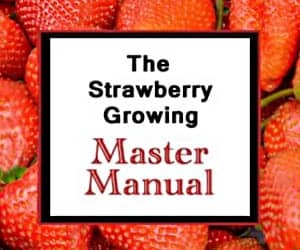 I’d recommend reviewing the material on the Growing Strawberries reference page to help you maximize your strawberry harvest for years to come. Good luck! This is a question submitted to Strawberry Plants .org by a reader. See the Strawberry FAQ for more questions, or use the search box to find more information. Planted Strawberries last fall, in a raised bed that is located under the drip line of tall Spruce trees w/a South Sun exposure. Covered the bed with Straw but this Spring the Strawberries did not survive the winter. What you recommend be done if I want to plant “New” Strawberry plants for this year & beyond? What do you know about using molasses to lower the PH of the soil , does molasses help with growing strawberries ? How much vinegar should put on my strawberry plants if my ph is 7.0? How do I apply it? You have to be very careful using vinegar to raise soil pH. The pH of vinegar is usually somewhere between 2.0 and 3.0, whereas strawberries don’t like a growing medium quite that acidic. If you use vinegar to raise soil pH, do it very slowly with frequent pH checks. Good luck! We recently cut down a pine tree, and would like to know if the soil would be too acidic to grow my strawberries? You could pH test it to be sure, but it should be great for growing strawberries! when using coffee grounds, citrus wastes, or pine needles how many pounds of each product would you need per 100 square feet. It depends. The best way is to add your organic acidifiers little by little and check the pH on a monthly basis. Typically, however, it is hard to get the soil too acidic using topical applications of organic wastes. Good luck!